“My name is Michael: Michael Vyner. I’m going to tell you something of my life and of the strange events that have brought me to where I now sit, pen in hand, my heartbeat hastening at their recollection. Following the death of his mother, Michael is taken in by the man his father died saving. Sir Stephen is not the man Michael was expecting him to be and in the depth of the English Countryside Sir Stephen’s house is holding its secrets. Evil and madness lurk within the walls of this once grand house and Michael senses it following him wherever he goes. If you have stumbled across the pages of my blog before you may be aware that I love ghost stories, and horror is one of my favourite genres, especially when it comes in the form of middle grade horror written by the fantastic Mr Priestley! The Dead of Winter has been on my shelf for a while now but obviously, as its a book set at Christmas, I kept it til now to read and it really did not disappoint! The story is creepy and mysterious. I picked up on a couple of things early on but some of the events still shocked me and I doubt many would see them coming. Chris Priestley did a fantastic job of creating suspense and allowing me as a reader to pick up on the shocking things just a few sentences before the narrator himself did which I really loved. The story was sweet because of some of things that happened, and incredibly sad in places too. The characters were brilliant and I loved the relationship that Michael created with some of them, particularly Hodges and Clarence. I thought Charlotte was a bit odd from the start but her oddness is overshadowed by that of Sir Stephen and his current ailments. The creepiness of the story is created from the start with Michael becoming an orphan and the idea of death following him around. He nearly dies in the story and other characters are close to death or even die too. That along with the old house in the middle of nowhere on the marshes and the strange things that happen to Michael when he gets to Hawton Mere are what really make the story and I felt suitably scared as I read through the book… I wouldn’t pick it up at night if I were you! Chris Priestley always does a fantastic job at setting scenes and making you want to look over your shoulder with every new page. I think this was possibly one of his weaker books but only because the short stories in the Tales series work really well and Mister Creecher was set in the world of Shelley’s Frankenstein so they are highly viewed in my opinion. I wouldn’t say that makes The Dead of Winter bad but I would start on the others if you want a great introduction to this brilliant author. 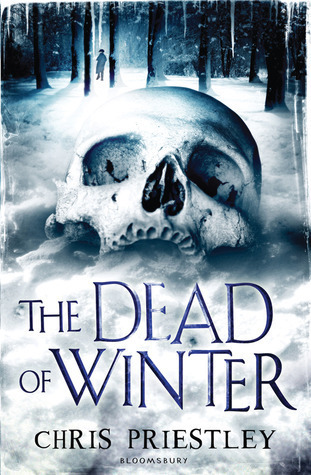 The Dead of Winter was published on 3rd October 2011 by Bloomsbury. My copy was purchased from Foyles in London.